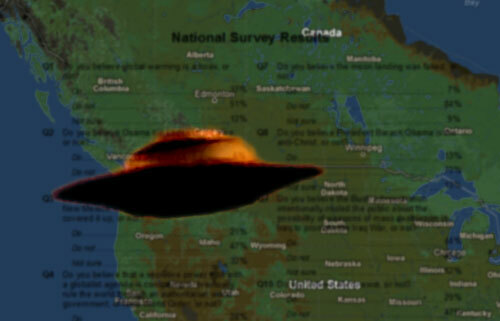 Two polls were published this week, revealing how many Americans and British Columbians believe in various conspiracy theories, including UFOs. 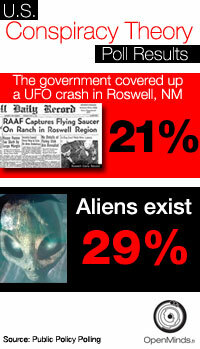 New polls are conducted regularly that ask about UFO beliefs, and the results always vary. A recurring problem with many of these polls is how the question is formulated. Most of these polls pose the question, “Do you believe in UFOs?” In most cases, the true question being asked by the polls is “Do you believe some UFOs are extraterrestrial?” But by asking the broad question “Do you believe in UFOs?” the results are less likely to be a true representation of people who believe in extraterrestrial UFOs. Previous: An alien code in our genes?